JUST REDUCED FROM $450,000 TO $435,000 BUILDER/OWNER OFFERING $$$ 1,000 TRAVEL VOUCHER TO LAS VAGAS WITH PURCHASE. The Fantastic Neighbourhood of Ritchie is changing with every new build. This Fabulous Front Back Duplex Home has just been completed. Beautiful Quartz Counters & Back Splash, Glossy Cupboards, High end Samsung Stainless Appliances, Finished Basement & a Garage completes this 3+1 Bedrooms with 3.5 Baths. The Home is located very near to Donnan Hockey School, U of A, Universite Francaphone & French District, Vimy Ridge Hockey Academy, Whyte Ave Shopping District, Strathcona Farmers Market, Millcreek Pool and Ravine. Buy One or Both Live in one Rent out the other! 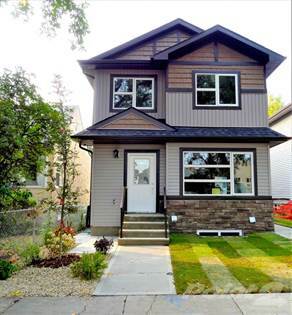 Hi, I'd like to find out more information about 9717-81 Ave.. Thanks so much!